Panel Built, Inc., manufacturer of modular building systems, is announcing a new program to bring expedited service to their customers. The new “Quick Ship” program at Panel Built provides dramatically reduced lead times on their basic Value Line modular office systems. Panel Built customers can now have a Value Line office system ordered, manufactured and shipped within two business days of receipt of a purchase order. Panel Built’s Sales and Engineering Teams will provide a fast free quote and drawing to expedite approvals and get the project into production. “We are now the industry leader on lead times, which is just one more way we can meet the needs of our customers,” explains PBI General Manager Dave Arnold. Quick Ship offices are manufactured with the same quality and attention to detail Panel Built gives all of their products, with new systems in place to improve efficiency and accelerate the production process. Panel Built provides support after the sale and all of their products are warranted. 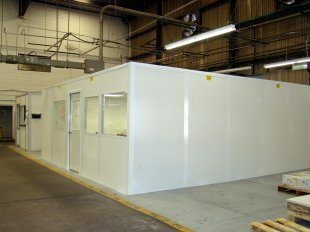 For a fast, free quote on a Panel Built Quick Ship office, call 1-800-636-3873 FREE. Standard lead times will apply to special colors or non-standard doors, windows and wall heights. Ask your Sales Representative if your project qualifies for Quick Ship or go to https://www.panelbuilt.com/general/two-day-quick-ship-office for more details.